Corfe Bears > Kaycee Bears > STARDUST 14.5"
View other bears from Retired Kaycee Bears. NOW HALF PRICE £67.50!! (Was £135)..........LIMITED STOCK! Stardust was created as a tribute to the great David Bowie and he wouldn't be complete without ZIGGY. 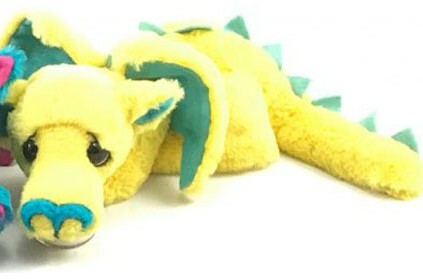 Stardust is made from a bright yellow plush fur and the inner ears and wings are turquoise suedette, while the spines are dusky blue felt. The tail is weighted, so feels really good to hold and can be posed in different ways, just like his namesake, who was a real poseur!! So if you want to add this iconic creation to your collection, then pre-order now. Kaycee Bears are created and designed by UK teddy bear artist Kelsey Cunningham, which are then made by her and the dedicated Kaycee Bears team. 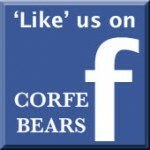 All of the bears are made with high quality, soft materials and the footpads are made from luxurious cashmere. The glass eyes are handmade in England and each bear has a pretty crystal in the footpad and has a swing tag showing the name and limited edition number, if applicable. Every limited edition Kaycee Bear comes with a Kaycee Bears bag. STARDUST is from the Kaycee Bears Autumn 2017 Collection.